It’s that time of year and we had a lovely pumpkin to make a traditional Jack-O-Lantern with. We decorated with some fun decorations for the kiddies and we have our treats ready! It’s not technically our holiday and we don’t really celebrate but we do like to give out candy and have a Jack-O-Lantern anyway in the interest of being good neighbours. This Jack-O-Lantern art also meant we had pumpkin seeds. Over the years I have tried lots of pumpkin seed recipes but about 15 years ago I found a really good one. The result is delicious roasted pumpkin seeds you can eat whole without taking the shell off. The first step is get your seeds sort of cleaned up. They don’t have to be perfectly clean, just mostly. Put the seeds in a pot and add a teaspoon of coarse salt with enough water to float all the seeds plus two inches. Bring the seeds to a boil and then simmer gently. You will need to simmer a long time until all the seeds have a clear cooked look. It takes about 45 minutes but you use the look of the seeds not the time to decide. How long the seeds need depends on the type of pumpkin you use and the ripeness. As you simmer, occasionally stir and the uncooked ones will show up as lighter. You’re ready to start baking when all the seeds are greyish and don’t float. In this image the seeds are about half cooked. Some are clear and have sunk down. Some are still floating. You can’t really over cook at this stage so keep simmering until they are all boiled and greyish. Don’t rush this step or you will have tough seeds. Once all the seeds are soft and greyish, drain the water. Add enough margarine or butter to generously coat all the seeds and spread them on a cookie sheet. They will be salty from the boiling but you can add more salt if you like. Bake the seeds at 350F until they are all dry and golden brown. Every few minutes stir them and spread them again. Be careful with baking and watch closely because you can easily burn them. This is what they look like as they bake. They will brown in spots which is why you need to keep stirring them or you’ll end up with burnt spots. Once the seeds are all baked to a uniform golden brown they are ready. No need to shell the seeds. The outside shell has been softened by the boiling and you just pop them in your mouth and eat them whole. I have been told the seeds will keep for a long time prepared this way, but they never have lasted to the time we blow out the candle on the Jack-O-Lantern at my house. YUMMY! Happy Halloween! 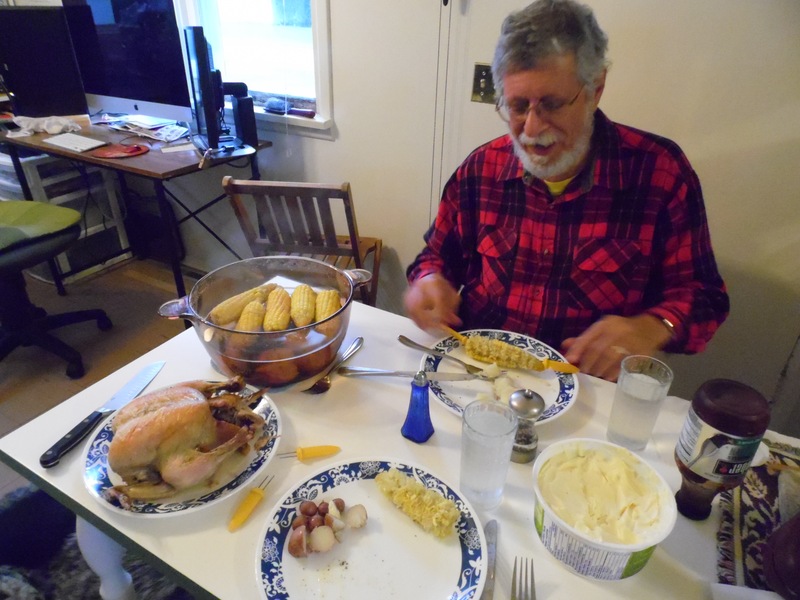 This entry was posted in Food preservation, Frugal living, Tumbleweeds Tumbling and tagged Halloween, pumpkin, recipes, roasted pumpkin seeds on October 31, 2017 by tumbleweedstumbling. The weather forecast was for a miserable cold rainy day followed by a typically Canadian abrupt switch to summer. The high was a mere 12C (54F) for the day I decide to bake but only two days later the forecast high was 27C (81F). I decided it was a good day to get ahead on home baked bread. This would heat our little house without using the furnace so the heat would serve two uses on a cold day. Plus making my own bread costs a small fraction of buying store bought bread. I bake my own bread for many reason. I started when I lived in a rural community where fresh bread was hard to come by without a long trip to the grocery store. In those days I had no machine to knead the bread and it was a chore. I quit when we left the farm and I went back to work. A few years later the local kosher bakery closed up and I was given a bread maker. On top of that, hubby dearest was told to go on a no salt diet and commercial bread is very high salt. I started using the bread maker. It was perfect for a busy career woman. Set it up on a timer in the morning and at supper walk in to the smell of fresh bread. The bread maker worked very well but…. Bread makers don’t seem to bake evenly. In such a small batch the variations of any batch of bread that have to do with moisture in the flour, temperatures, yeast and so forth get really magnified. You can get a bad “batch” often enough to be annoying and to feel the bread maker is unreliable. I eventually settled on using a Kitchen Aide with a dough hook for the kneading part. I make a four loaf double batch which is far more forgiving of subtle variations compared to the one loaf bread maker. It is a lot easier to get consistently good bread. I also like to make my loaves small so hubby dearest can have a two small slices of bread with crust all around rather than one huge slice produced by the bread machine which has to be cut in half and which will fall apart far more easily. I initially began giving up the bread maker by letting the bread maker do the kneading and then moving the dough to my own bowl and pan. With the Kitchen Aide the bread maker sat idle enough I eventually gave it away. This particular day I make four double batches of our favourite types of bread. They all ended up in the freezer to be taken out and used on one of those hot summer days when the last thing I want to do is be baking bread. In addition to poppy and sesame seeds I also top with oatmeal flakes and corn meal and small sprinkling of additional caraway seeds. The second batch I made was a light rye bread. The recipe is from CooksRecipes.com originally. The third batch of bread was honey, oatmeal, whole wheat bread, my own favourite. And the final two loaves are the special braided Sabbath egg bread called challah. I normally try to bake challah each Friday so we always have two fresh warm challah for the sabbath. Life doesn’t always cooperate so we have two pairs of emergency challah in the freezer. All fourteen loaves (less one slice) were double wrapped and slipped into the freezer for future use. We normally use about two loaves a week so I should not have to bake bread again (except for Friday Challah) until midsummer. There is something mystical and connected about making homemade bread. Even though I let the machine do most of the kneading I do get to handle the dough, work it my hands and feel the connection to our earth home. Baking bread becomes an exercise in philosophy, meditation and prayer. And is there anything to compare with the sweet scent of homemade bread? Homemade bread makes a house a home and sanctifies a holiday. It was a perfect way to pass a cold miserable day and prepare for summer. This entry was posted in Frugal living and tagged baking, bread, cooking on June 2, 2017 by tumbleweedstumbling. The forecast for tonight is 2C (35.6) with a risk of frost. And so it’s time to harvest my herbs. On the table is my summer savoury and a mix of cilantro and carrots. The summer savoury is something I don’t use a lot in cooking. However, I read an interesting blog about extracting essential oils from this herb and I thought I would try it. So after picking I set some aside in a bundle to dry but most of it is currently in, or waiting to go into my crock pot. After it’s been properly stewed I’ll distill the mix. The resulting essential oil should work well for cleaning. The cilantro I am handling a bit differently. I chopped the finer leaves up into small bits and spread it on a cookie sheet. That is in the freezer and once it is frozen I’ll just break it up and put the bits in a plastic jar in the freezer. I only really use cilantro in cooked dishes so I can just grab the jar sprinkle a bit in at needs and it’s as nice as fresh. Fall is kind of sad time for the garden. I have been busy cleaning the garden out. I pulled up all the corn stacks and I have picked most of the tomatoes. If it frosts they will be first to go. The cucumbers are still producing but I have enough pickles now so I am not going to try to keep it going by covering the plants. If it frosts it frosts and if it doesn’t, well bonus. I also noticed that white mildew has hit as it so often does in the fall. My spaghetti squash only produced two little apple sized squash. If we don’t get frost and the mildew doesn’t spread they might produce something but its unlikely. Note to self: next year don’t start spaghetti squash from seed. The season up on the 51st parallel is just too short. And so I am kind of hoping the frost arrives tonight because then the garden is finished and the work is done. I am mostly hoping the frost will pass us by and I can get a few more weeks of produce. We shall see what the night brings. One of the nicer aspect of fall is that the sun is now setting and it’s dark by about 8:30pm. The last few nights the northern lights have been absolutely spectacular and it’s been dark enough to watch them before bed. And so life on the 51st parallel is a series of tradeoffs. Down south they are still in summer heat but I’ll bet they don’t see a lot of northern lights like we do. Even in the bright city lights of Winnipeg the aurora was spectacular. We got an even better show. 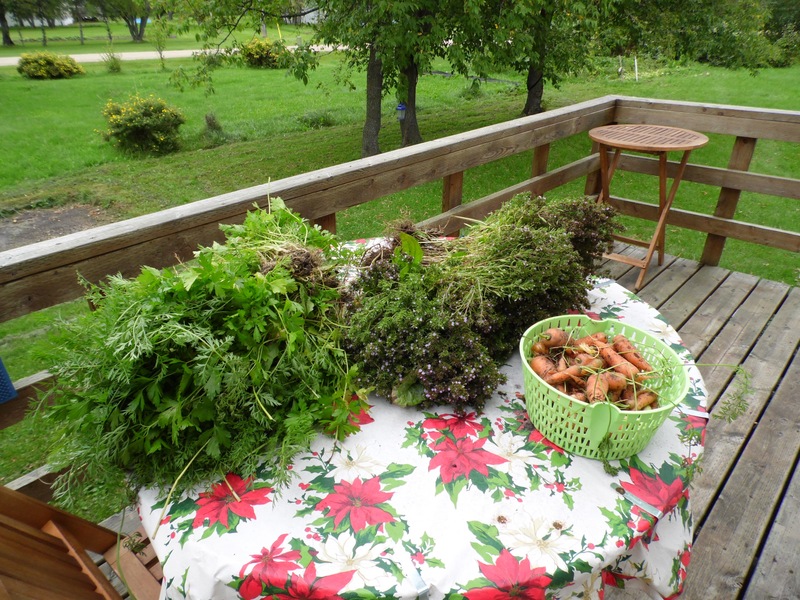 This entry was posted in Food preservation, Frugal living and tagged Alonsa, aurora borealis, Frugal Living, gardening, Manitoba on September 10, 2015 by tumbleweedstumbling.